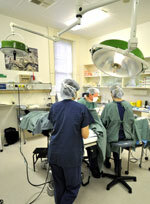 Dextra Day Surgery provides high quality surgery, pre and post-operative care servicing the practices of Randall Sach, Markus Nikitins and Clayton Lang. Our commitment is to achieve excellence within the guidelines recommended by ISO 9001: 2015 incorporating the National Safety and Quality Health Service Standard, and to make your stay as pleasant as possible with our highly trained, friendly and caring staff. The Day Surgery has contracts with all major Health Funds (including Department of Veterans' Affairs), thus facilitating claims for insured patients. Parking is usually available adjacent to the Surgery on South Terrace. Parking is available in surrounding streets. It is also available on Kensington Road, but please note that clearway restrictions apply morning and afternoon. Rear access is available for pick-up. Smoking is not permitted anywhere in either facility. Do not smoke on the day of your surgery.